My initial reaction to Orbital Nine’s physics-based game Brain It On! was that I’m too dumb for it. I nearly gave up after getting stumped just a few levels in. But instead, I decided to stick with it and see what would happen. At some point it just clicked and I was three-starring every level. I was hooked. Brain It On! has a very minimalistic appearance. Each level starts with an objective written across the screen. It can be as simple as “draw a shape” or as difficult as “place the ball in the orange box” (you’ll see that one a lot). 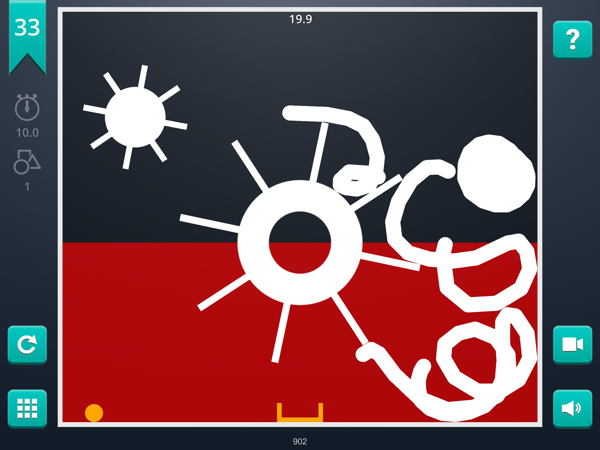 You then use your finger to draw on the screen. Whatever you draw will become a solid object that interacts with its surroundings. So if you draw a circle near the top of the screen, it will drop and likely bounce a bit. If you draw it near the bottom of the screen, it will hardly move. You can’t actually control the shapes after you draw them. The only way you can guide them is by drawing other shapes that might cause some chain reaction to achieve your goal. The game may require a lot of patience, depending on how good you are at figuring out these types of physics puzzles. I’ve definitely needed a lot of patience. Basically, the way I play is I try drawing something to see what happens. Based on the results, I’ll either tweak it a bit or try something completely different. If I see something is almost working, I’ll just keep changing it a bit, hoping it will eventually work. Surprisingly, this method has proven quite effective, even if it is a bit time-consuming. When I finally solve a level, though, it’s incredibly exciting. Take this level where I was told to flip the cup upside-down. I tried a shape that kept getting it to flip almost all the way, but the wall kept blocking it. I continued trying, though. Eventually, I got this result that you can see in the video below. It took many attempts to get that to happen, but it was such an amazing result that I must have watched the video a few dozen times right after. This is where the game really shines. 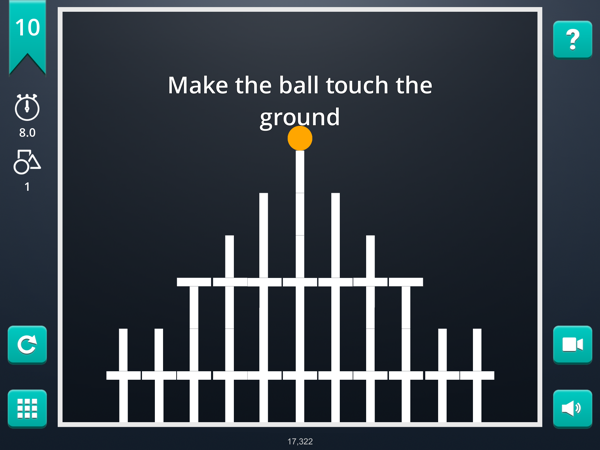 It was genius to include Everplay so players can record and show off their solutions to others. It’s also fun to see what solutions other players came up with. Brain It On! also has a very fair monetization system. The game is 100% free to download and play. Five levels are unlocked at a time. You need to complete four of the five to unlock the next five. Each level also has three stars you can earn. 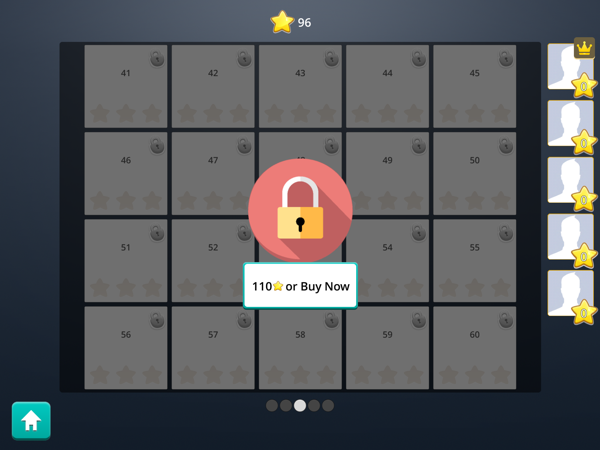 You get one star for solving a level, another for doing it within the time limit, and the third is for using no more than the maximum recommended number of shapes for the level. Attempting three stars is fun for the challenge, but it also provides you with enough stars to unlock every group of twenty levels. If you do so, you never have to spend a penny on the game. If you don’t earn enough stars, you can also buy in-app-purchases (IAP) of $0.99 per section. There are currently eighty levels, so that means if you want to unlock the sixty levels that are locked away initially, it will cost you about $3. There are also hints that you can access by watching an opt-in video ad. 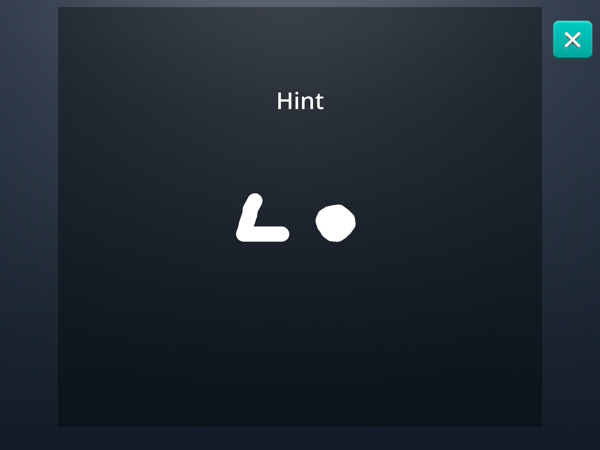 The hints show you which shapes to use for one possible solution. I do wish the hints would remain visible once you watch an ad for it, though. But these are currently the only ads in the game at the moment. So if you’re skilled enough, you can play the game without spending any money or seeing any ads . There are zero timers or limits on how many times you can try to solve a level. Restarting is also quick, especially on my iPad Air 2. So there’s no time wasted when attempting a puzzle over and over. The developer is also planning to add a one-time IAP to unlock all the levels and all hints for $3.99. So if you like the game but want to have access to all the levels from the very beginning, you’ll be able to do so for a one-time payment. I’m very vocally against consumable IAPs, but I think a system like this is more than fair. As you progress, you’ll be introduced to new elements such as red zones where you can’t draw anything. I’ve been able to three-star every level I’ve completed so far, so it is doable. But I’m currently stuck in the mid thirties, because the levels with moving parts have been giving me some trouble. The game can get pretty challenging. I now have three unsolved puzzles available to me at the moment, which all have me stumped. I’ll likely eventually buy the IAP to unlock all the levels so I can have more freedom. Overall, Brain It On! is a polished, unique physics game that is definitely worth checking out. Since it’s free to download, you have nothing to lose. It might not be for everyone, but if you give it a chance, you might just find yourself hooked, sharing your videos with the world. So go ahead and download the game here. You can also see more of my videos here.